Slowly making my way through the Compassion Alphabet by sharing posts that begin with each letter of the alphabet. So far, I have shared about Act for Compassion and Bite Back. Which means our next letter of the alphabet is...C! 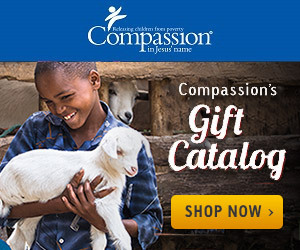 I thought about picking just one item to cover this letter, but Compassion has three things that make them distinct that all start with the letter C.
Christ Centered - I always tell people at events, there are a lot of wonderful organizations out there making a difference in the lives of many people around the world. One thing that sets Compassion apart is their commitment to sharing the Gospel. You can clothe people, feed them, and provide them with medical care, clean water, etc., but if they do not know that Jesus is the One who gives them eternal hope, all of that other stuff will not save them. Church Based - Who better to serve the children in their own community than the church members of the local church? I love that Compassion is committed to allowing the local church to partner with Compassion to share the Gospel with the children, and to give them hope to escape the poverty they were born into. Currently, over 6,700 churches in 25 countries are partnering with Compassion. Child Focused - Each sponsored child at every Compassion center is known, loved, and protected by the local Compassion staff and volunteers. The holistic child development model that Compassion uses provides each child the opportunity to grow up to be a fulfilled Christian adult. And each child is paired with a sponsor who is able to pray for and encourage the child through letters and gifts. Any guesses on what the topic will be for the letter D? On this morning, we packed up our bags and left our little place in Rome to prepare for our next destination in Italy. Found another little cafe for our morning cappuccino and croissant. Out of the three so far, this one was my favorite. L'emporio alla Pace had a wonderful little atmosphere and really good cappuccino and croissants! After our breakfast, we found a taxi and headed to the train station. Did I mention that we used all public transportation for this trip? We did end up relying on taxis instead of buses, which is a bit more expensive. But it kept us away from larger crowds and the possibility of being nearer to pickpockets. Thankfully, Lindsey booked most of our train tickets ahead of time, so we just had to make sure we got to the train station on time to catch our train each time! The trains were fairly easy to navigate. There were big electronic signs, like the one above, all over the place. Just find the final destination for the train, and you can find the train you need to be on. The train station is at the bottom of this hill town. To get to the top, you need to get on the funicular. Once we arrived at the top of the hill, we made our way further up the street to our AirBNB for the next couple of nights. By this point, we were hungry, but not super hungry. So we found a little place to get a bite to eat. We shared this pizza for 'lunch'. It was delicious! One thing we noticed in this little town north of Rome, a lot of the people knew English, but it was helpful to have the Google Translate app on my phone. Another thing we found interesting here...for dinner, the restaurants do not open for dinner until at least 7:30 or 8pm! In Rome, I believe a lot of the restaurants cater to the tourists, so many of them are open earlier for dinner. Since it was so cold, I really wanted a bowl of homemade Italian soup for dinner. Here at home, the pasta e fagioli soup that I make has a tomato base. I was able to find a recipe that is pretty close to what I had in Orvieto. Trattoria Delli Poggi, you won't regret eating here! Last week, I posted my first ABC's of Compassion post, sharing about Act for Compassion. Next up is the letter B. This week has to do with Jordan Foxworthy and mosquitoes. Now I know what you are thinking, neither one of those start with the letter B. Hang on, we will get to that. But first, let me tell you about Jordan Foxworthy. You probably know who her dad is. Her dad is Jeff Foxworthy. We used to watch the show he hosted, "Are You Smarter Than A Fifth Grader?" Little did we know when we first began sponsoring with Compassion, that Jordan and her dad had gone on a Compassion trip to Kenya. This video is from 9 years ago! And there is still a big malaria problem in the world, primarily in Africa. Children are dying every couple of minutes from malaria! But with the Bite Back program, for just $20, you can provide a life saving net for a family living in areas where malaria is prevalent. Sign up for a Bite Back kit! With the Bite Back kit, you can create your own fundraiser to raise awareness and funds to help more children sleep safely at night! So how are you going to Bite Back? Do you know what an f-stop is? If you are a photographer, I am sure you know what an f-stop does. For those of you who don't know, basically, f-stop is the aperture setting which controls what is in focus when you capture a photo. A large number like 8 and above give you more areas of focus in your photo and work well in landscapes or portraits of large groups of people. You can find better explanations of f-stop and aperture in many books, photography classes, and online articles. Just google f-stop or aperture if you are curious. One of my goals earlier this year was to pick up my DSLR on a regular basis and shoot photos. Well, I have done a terrible job of keeping up with that goal! This week, I stumbled across a Facebook Live event on the B&H page about 'What to Shoot When There's Nothing to Shoot'. You see, the thing is, I am not a professional photographer. I am not even sure I want to be a professional photographer. It is something I enjoy doing and would love to do it enough to get paid to do it! So I thought, in order to push myself to pick up my camera on a regular basis, I should give myself some challenges. This morning, I had my 35mm 1.8 lens on my Nikon and went in my backyard to see what I could shoot. Ok, so I didn't just 'find' my 50mm lens in the backyard, but I thought it would make the best first photo for this challenge. As I walked around my backyard, the only setting I had to change to capture all of these images was the shutter speed. At f/1.8, this setting lets in the most light available because the lens is open at its widest. So what do you think? Which image is your favorite? If you are a photographer, have you ever done an f-stop challenge? I am thinking I should challenge myself each week with a different f-stop. What f-stop should I shoot at next week? One thing I had to remember on this trip...I was not the only one traveling. In the past, I have been known to over schedule our travel days. Therefore, I couldn't make this trip all about what I wanted to do and every place I wanted to try to see while we were there. Since we had a pretty full day before, I knew we needed to scale back and take things a bit slower on our second full day in Rome. Can you even imagine how hard this was for me?!? Anyway, we planned for a slow morning with an afternoon trip to the Vatican. We purchased tickets ahead of time online and walked to a cafe to get our morning cappuccino and croissant. After our late breakfast, we started walking towards the Vatican. We were told that it is best to go to the Vatican either very first thing in the morning, or wait until the afternoon. And plan on at least 2-3 hours. I kind of had a feeling we would be there for more than two to three hours since this was the one thing on my husband's bucket list! Look at all of these people! And this is in mid February! Once we entered the Vatican Museum, I was so glad we were there during the off season. Can't even imagine what the halls look like during the height of travel season! We quickly passed by a lot of the statues and found a hall filled with tapestries. The detail on these tapestries was amazing! And look at when these were made, 1524-1531?!? This one hall was lined with tapestries on both sides. One side depicted different things about the popes, which I really didn't even look at. The other side was all tapestries depicting the life of Jesus. The tapestries were enormous! The one I shared above is over 18 feet wide! The hall with all of the maps of regions of Italy was my favorite. Looking at all the detail, I am not sure how people can only spend two to three hours in this place! We were finally getting closer to the Sistine Chapel! One thing I was disappointed about was learning that I would not be able to take any pictures of the ceiling in the Sistine Chapel! So I had to settle for taking photos of other paintings in the museum. The one above is a pretty famous one called The School of Athens by Raphael. Once you exit the Vatican Museum, you have two choices. Enter St. Peter's Basilica is what most people do. The other choice is to climb up inside the dome. Once we got to this point, we thought this was as high as you go. This view in itself is pretty incredible. But we quickly learned, there were more stairs to climb. The final set of steps you go up before you are able to walk outside of the dome are a set of tight spirals with a rope for you to use for the 'hand rail'. That was interesting! The trip down the stairs was much easier than climbing up all 500 or so steps to the top! It was starting to get late in the afternoon and we were not sure how much later St. Peter's Basilica would be open, but we wanted to make sure to look around inside before we left here. This...almost had me in tears. This is the Pieta by Michelangelo. What was going through Mary's mind as she was holding her beloved son and Savior after his death on the cross? Overall, I believe we spent over 5 hours here! I am so glad we didn't plan on trying to see too many things on this day. By now, both of us were starving since we hadn't eaten anything since our cappuccino and croissants much earlier in the day. We found a place online to try, but getting there was a bit of a challenge. Eventually, after walking past the restaurant, we found the place we were looking for! Cantina e Cucina...this place had some great reviews online, and there was a bit of a line. We started chatting with a couple of men who said this was a great place to eat. They live in England and travel to Italy for work. Can you even imagine that? Hoping on a plane and being in Italy in just a couple of hours? Anyway, this is not the place to go if you are looking for a quiet dinner. It was an interesting set up inside with lots of seating for just two people. But the tables were really close together. We ended up chatting with the couples on either side of us. Which was actually kind of fun! Tiramisu, again. Might as well compare it with the one I had the night before! Have you ever been to Rome? If so, what was your favorite part of Rome?